It sounds like a bad joke à la Alice in Wonderland: “Why is a barbershop like an art gallery?” At Black Eutopia, the question is taken seriously. This past Friday, Carter’s Barbershop in North Lawndale briefly became an open forum for visual, performance, and auditory art. Black Eutopia is the first in a series of pop-up events organized around the West Side by activist Rae Taylor and West Side Art Chicago’s Leah Gipson. The events are meant to explore the interplay between labor, art, and community. 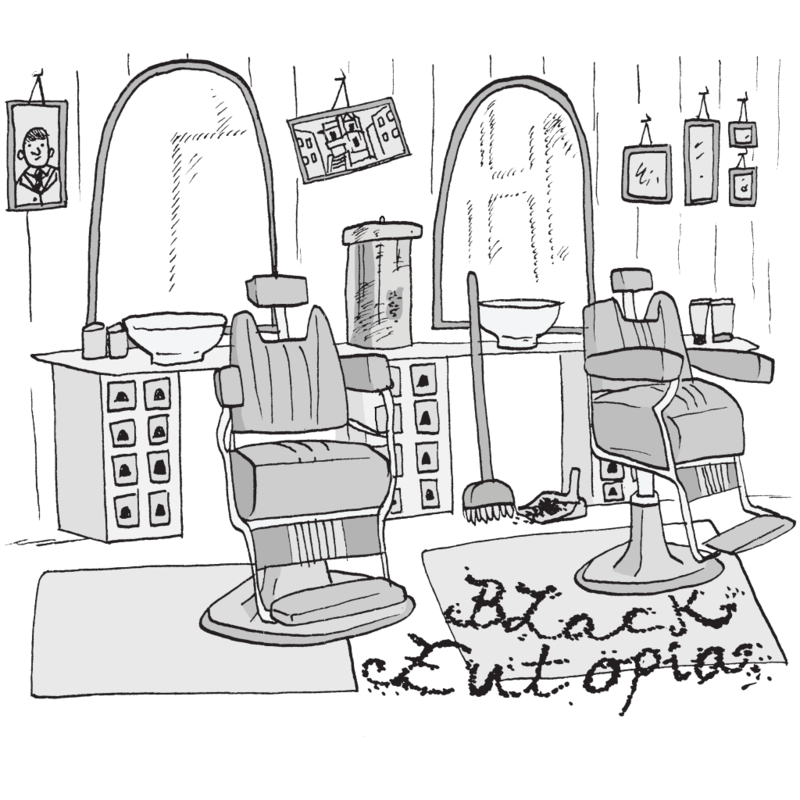 While Black Eutopia was advertised in the city and publicized by Chicago Artists Month, most attendees were there for a haircut and had no idea that they were walking into an art show. At 1pm, when the event was supposed to be starting, three men were getting their hair cut by three barbers. Being a barber requires skill and artistic vision: the barber is a sculptor of hair, which is riskier than sculpting clay—clay can be remolded or thrown away. Hair can also take on a life of its own. The main visual art on display included selections from local artist Krista Franklin’s “2013 Narrative(s) of Naima Brown.” The multimedia pieces highlighted what has been nicknamed “tumbleweave,” or errant pieces of weaves found on the street. Franklin incorporates this “tumbleweave” with other media: in one piece, a set of fake nails is glued to the center; another piece is flecked with the shiny gold of a gum wrapper. Because they are on thin sheets of paper, the weaves add texture and dimension. Grey-blue paint and cool-toned shredded paper give the works serenity: it’s easy to forget what they are made of. Organizer Leah Gipson also had a painting on display. Bright colors and bold lines depict a young black woman sitting and feeding her baby. On the top right corner, “Free Marissa Now” is confidently scrawled in blue paint. The painting is an ode to Marissa Alexander, a Florida woman who faces 60 years in prison after firing a warning shot to scare off her abusive and estranged husband. Gipson hopes that enough people passed through the event to see the painting and gain awareness of Alexander’s plight. The barbershop’s permanent decorations stood alongside the exhibit’s artwork. Posters of Martin Luther King Jr., Malcolm X, and Muhammad Ali covered a corner wall. A Barack Obama poster triumphantly declared, “This is Our Moment.” Another poster, from the Smithsonian, had a picture of the “Afro-American Migration” with the words “Field to Factory” across the top. Rae Taylor noted that the barbershop was artistic in its own respect—she saw no need to change what was already on display. But why put up art in a barbershop? Taylor argued that a barbershop is the perfect setting for Black Eutopia, because “it is such a comfortable, communal space already, that it’s like, ‘we’ll bring the art to you.’” Gipson agreed: “We figured we’d try to get some of the locals and the people who were coming through to get their hair cut,” she explained. And as for the name, Taylor explained that the “e” in “eutopia” was heavy with meaning. “Oftentimes when you read the definition of utopia,” she said, “people are so against it, like it’s too perfect, to the point where you won’t have any stories to tell about the utopic experience.” The added “e” makes the idea of utopia slightly more attainable. “The event is called Black Eutopia, so it’s really about place, but it’s not just physical place,” said Gibson. “It’s emotional place, mental place, it’s all the things that make up community.” Carter’s Barbershop is unassuming—folding chairs, a fridge resting precariously on two milk crates, and an old-fashioned Pac Man arcade machine clutter the small room—but on Friday it felt like a eutopia.